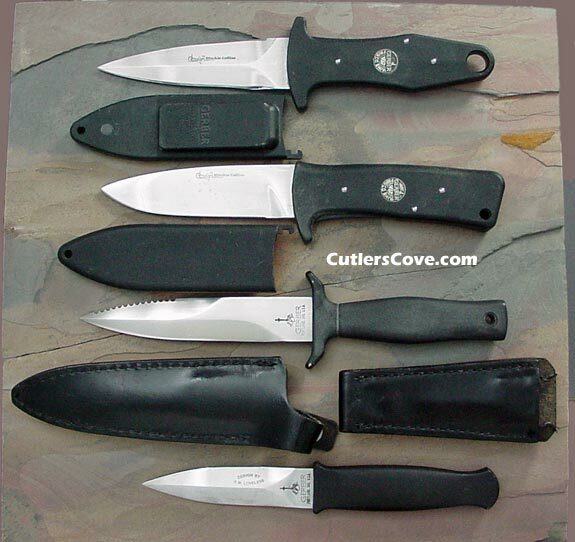 Gerber dagger knives. Gerber Guardian, Gerber Frisco Shiv dagger, Gerber Frisco Shiv drop point, Gerber Command I.
Gerber dagger knives. We only have one of each knife to sell. Gerber Frisco Shiv dagger, Gerber Frisco Shiv drop point, Gerber Command I, Gerber Guardian. Gerber Guardian, near mint to excellent plus, (Ex+) serial no. C4534S; a companion model to the Mark I. It has been sharpened with several scratches on the blade. The blade is very full and not sharpened much but they did scratch the metal. The handle is in near mint condition. The sheath is better than excellent condition. It is 7-1/4" overall with a 3-1/2" blade. This is the original model of the Gerber Guardian, which came out over 20 years ago and not a current model. Marked on the blade Designed by R.W. Loveless. The handle is black Armorhide metal. Includes the original black leather sheath with boot/belt clip. I think this is from the early 1980's. Later units had a black Cordura sheath in place of the leather sheath that this one comes with. Gerber did not make this knife for a long period like the Mark II and a lot less were made. Loveless is arguably the most influential custom knife maker of the 20th Century. Bob Loveless began a series of collaborations with leading knife companies in the 1980s to produce knife designs to exacting standards that would make them available to a larger market at affordable prices. If I remember correctly only the first units where marked with the Loveless mark and the later ones did not have this mark.